A couple of days ago I wrote about gathering and preserving rhus glabra, or smooth sumac, a departure from my usual rhus typhina, or staghorn sumac. These are only two of the roughly thirty five species of red berried rhuses, and as far as I can tell, their flavours are similar enough that they can be interchanged in recipes very easily. So while I have used the smooth sumac liquid, i.e. berry infused water as a base, you could substitute this with any other edible sumac. I have made a few natural sodas lately, including tonic water, and the success I have had with all of them has encouraged me to continue experimenting. As sumac is great in a lemonade, tea or mead, I figured it would make a decent soda too. I was not disappointed. Besides the sumac ‘juice’ as described in my last post, you will need some honey and some starter or bug for the fermentation to take place. The process for making a bug can be found here. Once your bug is ready, you mix the three ingredients in flip top bottles. Ginger is the most common root to use, but I also use dandelion and chicory root where I don’t want a strong ginger flavour as is the case with this drink. My general rule is to mix the ingredients so that the initial mixture is sweeter than you want the end product, since much of the sugar gets used up in the fermentation process, so while there is a high ratio of honey, the drink is still quite dry. However, the fermentation is speedy and effective, so be warned. I try it after three days instead of the usual five, and open the bottles every two days to let excess gas escape. The drink will continue to ferment, so once you are happy with its flavour and fizziness, keep it chilled. The proportions I used were as follows: 1 cup bug, 1 cup raw honey, 3 1/2 cups sumac juice. So here is a soda that is not only delicious but actually good for you. I will be sharing it with the guests at Angie’s Fiesta Friday #104, where I will be co-hosting along with Mila from Milk and Bun. Do drop by for some extraordinary recipes, and if you are a food blogger yourself, feel free to post a recipe of your own. The clear and simple guidelines are outlined here. Categories: beverage, drinks | Tags: fermentation, Fiesta Friday, natural soda, rhus glabra, rhus typhina, smooth sumac, staghorn sumac | Permalink. I have always associated elderberry (sambucus nigra) with Scandinavia and Eastern Europe. 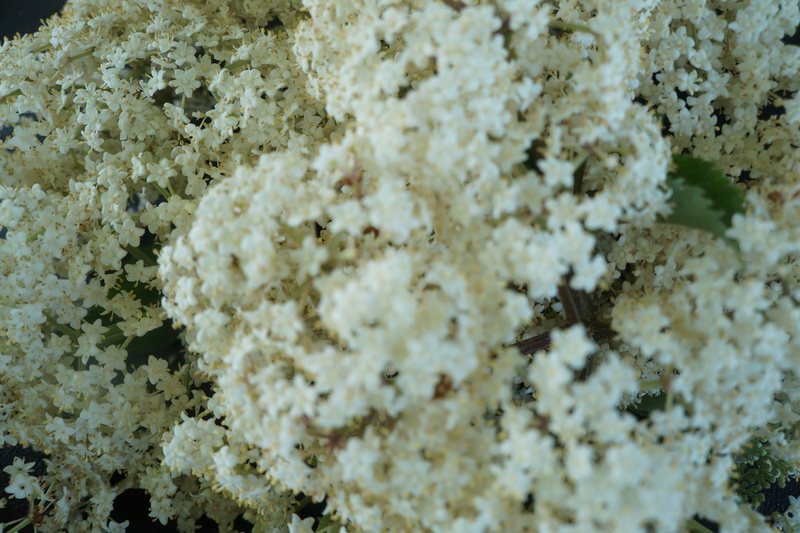 The delicate elderflower syrup was an import and a bit of a luxury to me. So when I discovered that it does grow here in Ontario, I determined to find some before the beautiful flowers disappeared. This large shrub or tree can grow to about 6 meters high and wide. 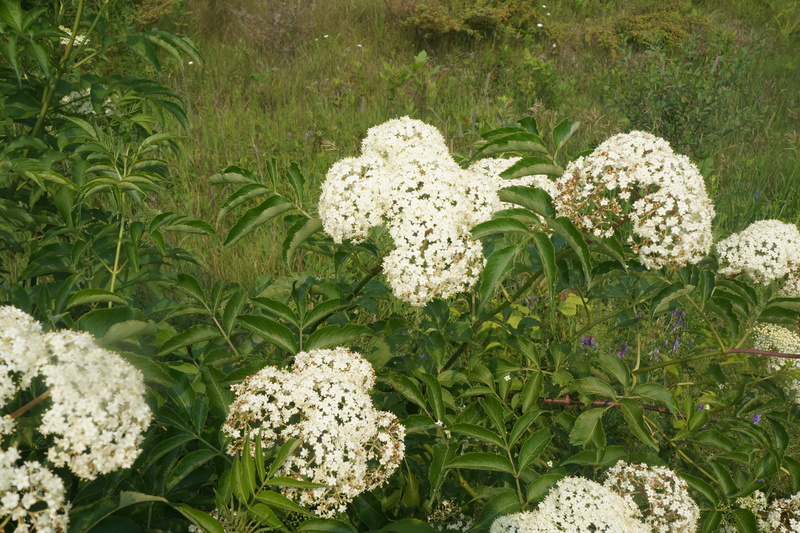 It has clusters of dainty white five-petalled flowers. The leaves are pointed and serrated, and about two inches in length. It grows in sunny, moist areas, usually near swamps, rivers or lakes. They have a pleasant but mild scent. The leaves, stems and unripe berries are toxic. The flowers are rich in bioflavonoids, and have anti-viral and anti-bacterial properties. The one contraindication for them is that because they reduce blood sugar levels, they are not recommended for diabetics. If you are interested in reading more on the health effects, refer to this site. 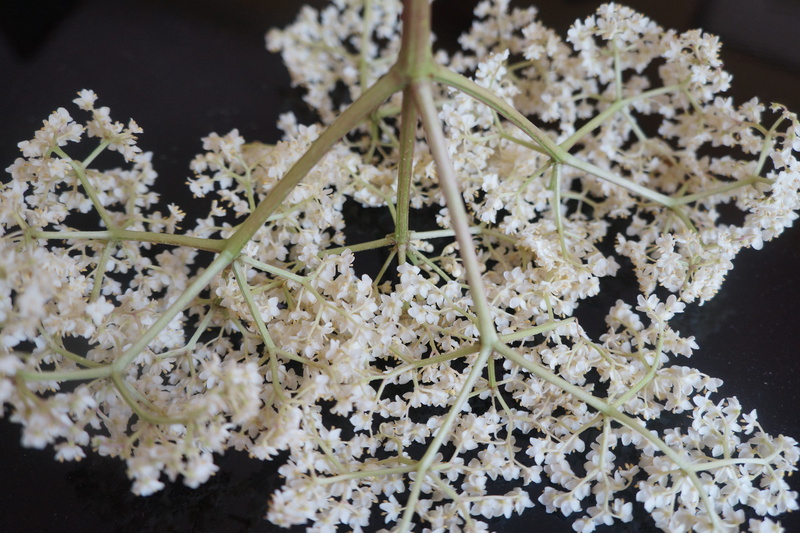 To pick them, it is recommended to pick just one cluster of flowers from each branch so that the rest can produce berries. Lightening the load a bit will not only not harm the plant, but will remove some of the excess growth. Wild plants need a little pruning sometimes too. Once properly identified, the clusters are easy to remove. And just a few will go a long way. They can be dried, fermented, infused, baked or fried. To start with my first batch I decided to make a simple syrup and some fritters. First I checked each flower for any insects and gave them a gentle shake. I did not wash them as they are delicate and didn’t want to wash away any of the flavour. To make the syrup, I simply snipped off the umbrels (or individual clusters) and put them in a pot and covered them with water. I brought the water to a boil, strained the lot through a fine sieve lined with a paper towel. Once the flowers are in boiling water, they turn yellow and develop a delicious aroma. I returned the hot liquid to the pot and added sugar, about 1/2 cup for 4 cups of liquid, at which point the yellow became even deeper. Heat just enough to dissolve and pour into a clean jar. This syrup will not have a long shelf life, but refrigerated will last about a week. A small amount like this can be consumed in no time. To serve, I mixed about 1 part syrup with 3-4 parts soda water, A little ice and you have yourself a refreshing and nutritious drink. For the fritters, I used a recipe which can be found here. The batter is a simple mixture of 4 Tbsp of plain flour, and enough sparkling water to make a thin batter. I used 10 Tbsp, slightly less than the recipe called for. Dip the umbrels in the batter and deep fry them for about 1-2 minutes. When the flowers become stiff, but before they brown, they are ready. Drain them well on absorbent paper. For the sauce, I mixed together some crabapple paste, chipotle sauce and a little olive oil. The mixture of 1 tsp each of salt and sugar along with a spicy sauce really make these little fritters special. Categories: drinks, edible flowers | Tags: appetizer, crab apple, dairy-free, elderberries, elderflower syrup, elderflowers, foraging, fritters, identification of elderflowers | Permalink. You’ve maybe come across Herb Robert before, otherwise known as geranium robertarium. He can grow just about anywhere, is shade tolerant but is just as happy in full sun. I usually find him in my flower beds, lodged in amongst rocks, and I recently saw him in abundance while walking in the woods. A delicate plant with lacy leaves and dainty pink flowers, too pretty to pull out, but too invasive to just ignore. I only recently started to find out more about this plant which has a long history of medicinal uses, most notably the leaves taken as a tea to boost the immune system. If you are interested in reading more about this remarkable little weed, its history and uses you can read here. I was most interested in the fact that it is considered a natural insect repellent. It has what is considered a ‘foxy’ odour which rabbits and deer stay clear of, but is not that strong to humans. I have followed some advice I read and planted bits of it around my cabbages and cauliflowers to deter bunnies. So far, it seems to be working! It flowers from spring through late summer or fall and spreads its seeds on a regular basis. When walking in the woods, I decided to try it as an insect repellent to defend myself against the hoards of mosquitoes. I rubbed the leaves and smeared them on my skin. I noticed some difference, but was not ‘out of the woods’ exactly. Then a fellow joined me, and I noticed all the mosquitoes attacked him, so it must have made some difference. I decided to try an insect repellent that could be applied more easily and evenly than the leaf-rubbing method. After all, the heat and sun are nothing when gardening compared to the discomfort of the mosquitoes. I put two parts herb Robert leaves and flowers, one part mint and one part lavender flowers and pressed them down with a plate or lid which would fit inside the pot. I barely covered that with water, brought it to a boil, turned off the heat. Then I left it to cool covered with another lid to keep the essential oils from escaping. Strain off the liquid and mix with equal parts of rubbing alcohol. Apply it liberally all over. In the late morning, I headed out with my pitchfork to do some heavy mulching and see if my concoction worked and if so, how long it would be effective. I lasted a whole hour with very little trouble from mosquitoes. I finally gave up because now the heat and sun were my biggest problems. I’m not sure what its shelf life is, but it can be easily replenished and costs next to nothing. It has a lovely fragrance, and I expect I will go through it rather quickly to help me through the season. Categories: DIY, drinks, edible flowers, edible weeds | Tags: geranium robertarium, Herb Robert, insect repellent, lavender, mint | Permalink. This is the time of year when we really can make the most of the maple syrup we made in the spring. Not much of it gets used during the summer months, so I find I still have a good reserve to experiment with. Of course, there are always the tried and true recipes, but using it as a sweetener for much more than baking and pancakes/waffles has become one of my favourite challenges during the winter months. So for this first Fiesta Friday of 2015, I am bringing a vegan version of egg nog to drink a toast to all my friends at this event – especially to the ever gracious hostess, Angie @thenovicegardener and her two co-hosts this week. Mr Fitz @CookingwithMrFitz and Kaila @GF Life 24/7. I often choose to pair maple with walnuts – an easy match for so many recipes. For a change, I used chestnuts. They are rich and creamy, and I believe the sweetest of all the nuts. They are no longer grown in this area, and it is difficult to find really good ones, but I made use of what I was able to find. A vegan milk, such as almond, a hint of spice, maple syrup and possibly a splash of dark rum make this a wonderful alternative to the traditional drink. If you don’t have fresh chestnuts available, you might find tinned chestnut puree in specialty shops, or use unsalted cashews in their place. If using fresh chestnuts, you will need to roast them first. Simply score a cross with the end of a sharp knife through the shell on the flat side. Roast them in the oven at 350 for about 45 minutes, until the nut feels soft when pierced with a knife. Allow to cool and peel off the outer shell. Pour boiling water over the nuts and leave for a couple of minutes. Cool under cold water, and the papery layer under the shell should slip off easily. Then chop and measure. For this recipe, I used 3/4 a cup of chestnuts, hot water to cover, 2 cups of almond milk, two Tbsp maple syrup and 2 Tbsp of dark rum. This last ingredient can be omitted, in which case you might want a bit more syrup to taste. Once chestnut mixture has cooled, put everything in the blender and process until it is completely smooth. Chill and pour in glasses. Sprinkle a little nutmeg on top. Categories: alcoholic beverage, drinks | Tags: chestunuts, egg nog, Fiesta Friday, maple syrup, vegan egg nog | Permalink.